Meet Kevin Mench, owner of the game's biggest cranium... and some pretty large feet. Hard to believe it was 20 years ago today. 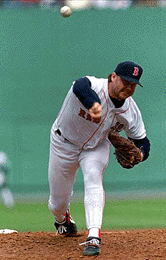 It was a cold, damp spring night at Fenway, with young fireballer Roger Clemens against Mike Moore and the strikeout-prone Seattle Mariners. Seattle's lineup had old war horses like Gorman Thomas and Steve Yeager, free-swinging Danny Tartabull and Phil Bradley, and two guys who would eventually figure heavily into the Sox' post-season march in 1986 --Spike Owen, Clemens' former college teammate at Texas, and Dave "Hendu" Henderson, who would hit one of the most thrilling home runs in Red Sox history five short months later. I was a freshman in college, watching on an old black and white TV with a couple of guys on my floor. Clemens had 9 K's after four innings, 16 after seven, and as we all know, a major-league record 20 when he blew poor Bradley away (Bradley fanned 4 times) for the second out in the top of the 9th. 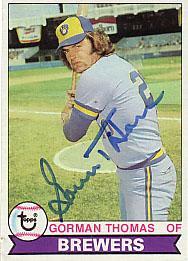 Roger could have made it a symbolic 21, but Ken Phelps actually mustered a ground ball for the final out of the game. - According to the box score on retrosheet.org, a grand total of only 13,414 watched the game in person at Fenway. Could have been the weather... or it could have been the fact that back then, the Red Sox were third fiddle in this town, after the Larry Bird-led Celtics and the Neely/Bourque/Moog Bruins. You know, back when our winter sports teams were actually competitive... what a difference two decades make. Okay, time to put an end to this ugly skid. The Red Sox have looked befuddled and confused in all phases of the game since this road trip began in Toronto, and last night they were listless again in losing to the Devil Dogs and Casey Fossum. The indignity of it all! 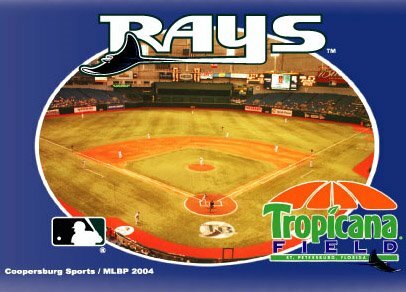 Tonight, the boys try to scratch out a win in St. Pete, home of Tropicana Field and a hotel some players firmly believe is haunted. You have to like the chances of the offense snapping out of its slump - especially against someone named Doug Waechter. Only problem is we've got Lenny DiNardo going, pride of Team Italia. Oh well, if it's out of hand by the third inning again, we can always switch over to ESPN and see who the Patriots are taking with their 7th round pick. Yankees 'God Bless America' singer Ronan Tynan and everyone's favorite movie cartoon character, Shrek. Okay, it's a bit harsh. But Tynan is a Yankee. Kind of. It was the kind of night where Rudy Seanez was pitching in a 9-2 ballgame and couldn't get anyone out. The kind of night where Don O and the Rem Dawg were in full giggle mode by the 5th inning -- making fun of ridiculous-looking Clevelanders in the stands. Just a bad all-around 'performance' by the boys tonight in their series finale against the Indians. 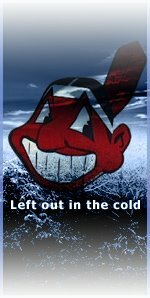 It's now 12-3 Indians in the 7th and here's hoping this one is over real soon. Very f'n ugly, both at the plate and in the field. Beckett didn't have it tonight, and he's developing an uncharacterisic problem with the gopher balls. He gave up three bombs tonight -- two to the mighty Ben Broussard (7 RBIs) -- and he's now given up a total of six on the year. 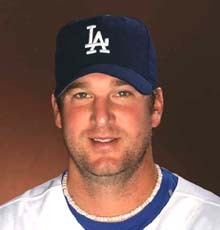 From 2002-2005, he gave up an average of 13 a year. Something to keep an eye on. Oap.. it's now 14-3 Indians. We're getting into football score territory. Make it 15-3. It's baserunning practice for the Tribe. Anyone for 20? Yes, it's still April, and yes, this team will be in contention down the stretch. But some disturbing patterns have emerged early, and they're worth mentioning. The starting pitching, ex-Beckett and Schilling, is worrisome. On the days those guys don't pitch, we don't know what we're going to get. The bottom of the order is absolutely atrocious. Mikey Adams on WEEI had me chuckling last night with his mini-rant following the game, making note of the light-hitting (that's being kind) Alex Gonzalez watching several juicy fastballs go right down the pipe. 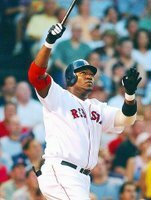 "Who does he think he is, Manny Ramirez??!" asked Adams. "Hmmm, let me get the count to 0-2 and then I'll really focus." Exactly what I was thinking -- Gonzalez should simply swing on every single pitch. Josh Bard (we'll get to him in a minute) and Dustan Mohr are almost as useless with a bat in their hands. It's a problem, and that's not an overreaction. We've talked about the shaky bullpen - who'da thunk Foulke would be favored over Timlin at this point? And finally, the issue of the day: we cannot afford to watch Josh Bard learn how to catch Wakefield during the season. The guy has 10 passed balls in four games, and on several occasions - including a crucial spot last night - his inability to catch Wake's butterflies has directly led to a run. 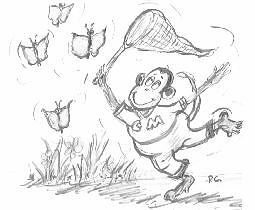 Maybe he should resort to using a net like our little monkey friend. 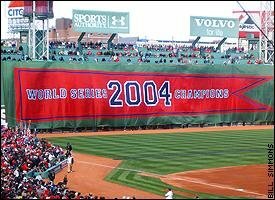 The Bard apologists this morning are saying that a) four games is too small a small sample size, b) the team can't score runs when Wake's pitching, and c) even the best men who've worn the tools of ignorance (including Varitek and Mirabelli) have had major problems catching the knuckler. All valid. But the point here again is that we can't let this guy practice during the regular frickin' season. He missed a couple of pitches last night that were at eye level, and unfortunately one of those came with a man on third and the Sox still in the game, trailing 3-1. It just takes the air out of any potential momentum. Something needs to be done before Wake faces the Yankees on Monday, and today's Globe has a report that the team signed a guy with a surfer's name for a reason. We'll see -- I hate to bury a young kid so early in the season, but this is serious bidness. As you already know, the Sox lost to Cliff Lee and the Tribe last night, 7-1. Lee's an underrated stud. He hasn't given up more than three runs in any of his starts this year, and the Sox have difficulties hitting lefties (a topic for another day). We saw a flash of that Wily Mo potential as the big guy lashed a homer to straightaway center. The kid's bat speed is sick - it's just that he doesn't always connect. Oh, and if you weren't grumpy enough -- Bronson Arroyo's line last night against the Nationals -- 8 IP, 1 hit, 2 walks, 8 k's. The corn-rowed one owns a 4-0 record, 2.34 ERA and 0.92 WHIP. Ouch. 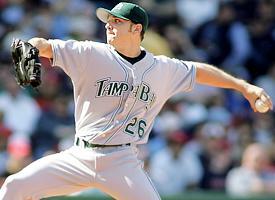 Josh Beckett vs. Paul Byrd tonight in the series finale. Thanks to Manny's blast, and the thunder bolt right arm of one Jonathan Papelbon-bon (right), the Sox beat the Indians tonight in the first of three at the Jake. 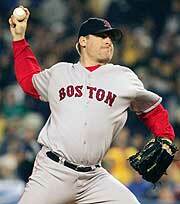 While the bullpen has been a disappointment so far, one nice surprise has been the re-emergence of Foulke. 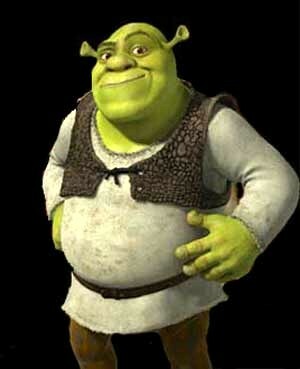 He's been an effective set-up man for Papelbon. Hitters have to see his crazy changeup and then they have to face Papelbon's seeds. Kid was pumping it in there at 95-96 on a cold night. Sox are now 13-7, two games up on the -- surprise -- Yankees. Wakefield goes against Cliff Lee tonight. Here's hoping Josh Bard brought his running shoes. 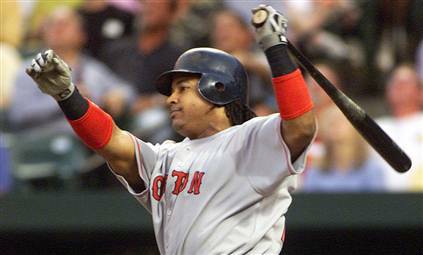 Manny just went yard for a three-run homer to give the Sox an 8-5 lead in the 8th. In typical Manny fashion, the ball barely cleared the right field fence and he went into his home run trot right out of the box. God, this guy is maddening. By the way, I am officially in love with Hazel Mae. Yowza. 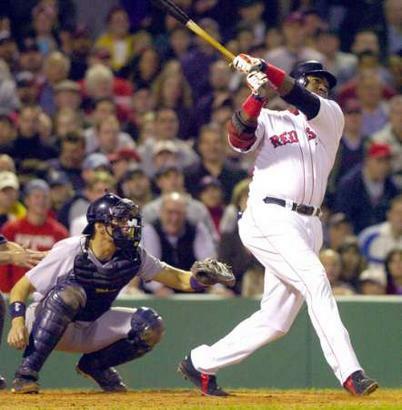 David Ortiz hit 20 home runs last year that either tied the game or put the Sox ahead. He hit five bombs and batted .400 in the magical 2004 postseason. The man is the epitome of clutch, and he just did it again in Cleveland, off Scott Sauersuck ('member him?). Eric Wedge brings in a lefty to face the big man, he gets a rolling curveball, and he promptly deposits it about 15 rows up in right field. We already know this, but we're witnessing something special with this guy. Currently top of the 7th at Jacobs Field, where the weather is more fit for a Browns-Bears game. Schilling has had a strange start - he was racked around pretty good through the first four innings, as the young, aggressive, very talented Indians hitters showed they could catch up with his fastball. So Schill adjusted on the fly, and started throwing more splitters and off-speed stuff. He's settled down some, and now has eight K's. Mike Lowell just singled in Manny for the go-ahead run. Sox lead 5-4. Of course, Manny was just touching 3rd base when the left fielder got the ball and he would have been dead meat if Victor Martinez had held onto the ball. Would have been our second Manny Moment of the evening - he got picked off second earlier in the game. Tribe just tied it up... Casey Blake led off the home half of the 7th with a double, and Grady Sizemore knocked him in. I'm smelling extra frames tonight. Yanks have blown it open against the D-Rays in New York - they're up 8-1 in the 7th. The weekend series against Toronto brought three glaring weaknesses to light -- the bottom of the order ain't what it used to be (some combination of Mohr, Gonzalez, Harris, Cora, etc. ), the middle relief corps (Seanez, Tavarez, Riske) stinks, and the starting pitching depth isn't very deep. Sox are now 12-7 on the season, still a game and a half up on the Orioles. Day off tomorrow and then back in action against Cleveland Tuesday night. Schilling goes for five in a row against Jake Westbrook. So the Sox are cruuuuuising last night... Beckett's throwing peas and big benders, Ortiz has gone deep, Manny has awoken from his lumber slumber and gone deep twice... the Sox are up 6-2 when the Jays come up in the bottom of the 8th, and you're sitting there with visions of Jonathan Papelbon blowing away the Jays in the 9th for another save... and then it all goes shockingly awry. Russ Adams, budding superstar Vernon Wells, and always scary Troy Glaus all hit bombs in the 8th and all of a sudden it's a tie game and we're heading for extra frames. The Jays' bullpen looked impressive in the extra innings - particularly Justin Speier - and the Jays came through in the bottom of the 12th to win it, 7-6. Good ballgame, crappy result. 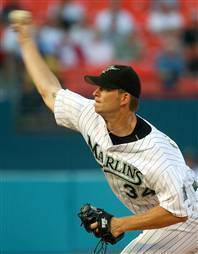 The game was a matchup of former Marlin guns Beckett and A.J. Burnett. Beckett lost the game, but the Jays and Burnett may have lost more. Burnett was pulled early with elbow problems, and we later learned that he's heading directly for Alabama to visit with Dr. Andrews. Not what you want to hear if you're the guy who ponied up $55 million for A.J. Curt Schilling pitched the Sox to an easy victory Wednesday night, but the boys lost the final game of their opening homestand tonight to the Rays and their young ace, Scott Kazmir. Just watching on TV, you can tell this kid has incredible stuff -- his matchups with Manny tonight were intense. Imagine if the Mets hadn't made one of the worst trades of the last decade -- Victor Zambrano for Kazmir. Ouch. Anyway, Schilling's first four starts have been hugely encouraging. I don't think we knew quite what to expect from the loquacious one, but he's been sensational. His win the other night was classic command Schilling - 7 k's and a walk - and made him 4-0 to start the season for the first time in his career. 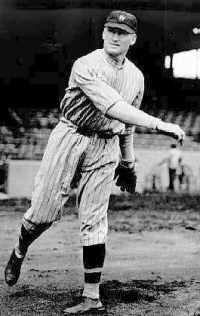 As the mo-rons on the radio said this morning, if the Cy Young voting was held today, Schill gets the nod. The other highlight from this game was the continued torrid hitting of Kevin Youkilis, known affectionately to the masses as Yooooook. The guy puts on serious at-bats - against any pitcher - he gets on base, and he's been better than advertised with the glove. If the Greek God of Walks keeps this up, J.T. Snow's gonna be one bored dude. Tampa Bay salvaged the last game of the series tonight by riding Kazmir's strong arm. He kept Papi and Manny in check, and Jonny Gomes hit two absolute moon-shots off Wake. Final score: 5-1. Sox are now 11-5, 2 games up on - believe it or not - the Orioles. The Sox get another crack at the much-improved Blue Jays, this time in Toronto. 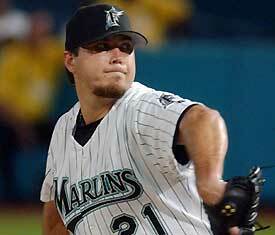 Great matchup tomorrow night of former Marlins studs - Josh Beckett vs. A.J. Burnett. 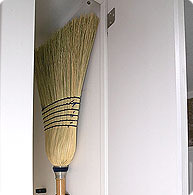 You know what I'm liking about this particular Red Sox team? The daily heroes have different names. Ortiz has done his usual damage, and Manny will do his. But every now and then, we're going to need a Loretta walk-off homer, a Youkilis clutch hit like he had tonight against the Devil Dogs, or a sprawling snow-cone catch like Adam Stern made to end tonight's game and preserve Jonathan Papelbon's seventh straight save. 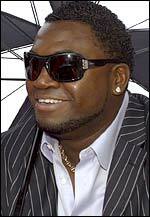 Yes, it's April and yes it's the lowly Devil Rays, but I'm liking how the Sox are playing with Coco out. Everyone's chipping in, they're winning close ballgames, and they're keeping the pedal to the metal as the Yankees continue to swirl around the drain. Sox beat the Rays 7-4 tonight, while Randy and the Yanks sucked the bit against the hot Blue Jays, 10-5. Sox are 10-4 on the young season; Yanks 6-7. Could this be the season the Yanks stay home in October? OK, that was my Chris Berman side coming out... Sox won a great ballgame today, 7-6, on a walkoff homer from Mark Loretta. The Mariners manufactured a run in the top of the 9th to take the lead, and things looked bleak in the bottom of the 9th as both Wily Mo Pena and Dustan Mohr struck out. Kevin Youkilis beat out a ground ball (I repeat, Kevin Youkilis beat out a ground ball) to keep things alive, and then up stepped Loretta, who wasted little time depositing an Eddie Guardado fastball into the Monster seats. Next up: those pesky Devil Rays, who come to town for three starting tomorrow night. The Sox are teeing off on Gil Meche in the 6th. Big Papi hit his second homer of the day - a 2-run bomb to right - Manny came within feet of hitting one into the Monster seats, and Trot just ground-rule doubled to right. Second and third, one out, they're intentionally walking the Captain to get to Mike Lowell -- is the season's first grand slam coming? All this comes a 1/2 inning after Jurassic Carl Everett put the Mariners ahead with a laser off the Pesky pole. Lowell grounds into a 6-4-3 double play. Bummah. 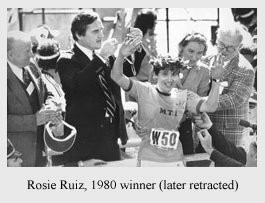 Where in the World is Rosie Ruiz? Red Sox took game 3 in their best-of-five hockey playoff series against the Seattle Thunderbirds today. The scores have been truly hockey-like -- a 2-1 Schilling/Papelbon win Friday night; a frustrating 3-0 loss yesterday; and today, behind the golden right arm of Josh Beckett, a 3-2 squeaker over Jarrod Washburn and the Mariners. On the glass is half-empty side, the Sox' pitching rotation after Schilling, Beckett and Wakefield looks awfully suspect right now. Wells is on the DL, Clement got racked last time out, and Lenny DiNardo gets the ball tomorrow morning in the Marathon Day finale vs. Seattle. If Theo knew Wells was still hurting, he might not have traded Arroyo to the Reds. On the glass is half-full side, two points: 1) If ever a situation was tailor-made for Roger Clemens, Boston is shaping up to be it. I know, I know - call me a dreamer. Maybe so. But I remember how important Roger's legacy is to him - he always kept track of stats and milestones - and what better stage to exit from than Fenway in the heat of a pennant race and hopefully some additional games into October? 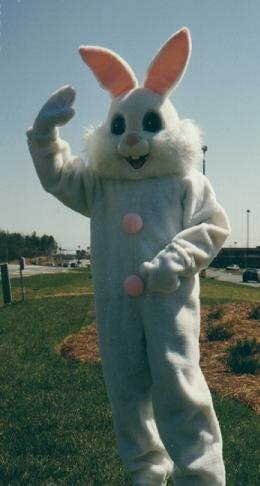 One thing's for sure -- Roger is coming back. He won't let a loss to Mexico in the World Baseball Classic go down as his swan song. My second point: It's nice to see the Sox winning 2-1 pitchers' duels -- because you know this offense will come around at some point and be a force. Tomorrow is one of the great days on the Boston sports calendar - Sox play the Mariners starting at 11:05 at Fenway. An hour later, the gun goes off in Hopkinton for the 110th running of the Boston Marathon. A good day to get drunk and cause general mayhem... if you're 21 and single. 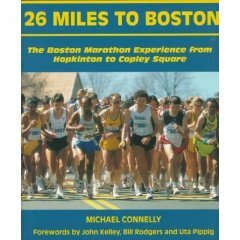 I, on the other hand, will be most likely taking a trip to Home Depot, then to a local playground, and then home to find out which Ethiopian/Kenyan runner won this year. Hey, can the Easter Bunny hit? If so, please report to 4 Yawkey Way at around 1:45 today. The Sox continued to slump at the plate yesterday, going down feebly to the Mariners, 3-zip. To be fair, the lineup didn't exactly inspire memories of Yankee Stadium circa 1927. Adam Stern led off, with Alex Cora in the 2-hole. Snow, Pena, and Gonzalez were your 7-8-9 hitters. Manny in particular is off to an extremely slow start - it's just a matter of time until he chops his reddish-orange dreadlocks off and goes with another look for good luck. 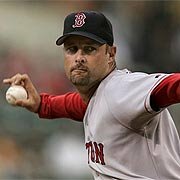 Despite the lack of run support, Tim Wakefield pitched valiantly, going the complete nine in the loss. Sox try to snap out of it today at 2 with Josh Beckett against Jarrod Washburn. The Mariners, living on West Coast time, have to deal with four different start times this weekend: 7 Friday night, 1:20 yesterday, 2:05 today, and 11:05 a.m. tomorrow on Marathon Monday. Which means those hearty M's fans will have to be in front of their TV's at 8 a.m. tomorrow morning with Starbucks in hand. A battle of old-timers last night ended with soon-to-be 40-year old Curt Schilling beating 43-year old Jamie Moyer and the Mariners, 2-1. Moyer made his debut in 1986 with the Cubs; Schilling made his two years later with the Orioles. Combined, the two brought 397 wins (Moyer 205, Schilling 192) and more than 4600 strikeouts (Schilling 2800, Moyer 1800) to the mound last night at Fenway, and both dueled admirably. In the end, light-hitting Alex Gonzalez came up with the key hit for the Sox, driving in their two runs with a double in the 4th. Jonathan "Lil' Mariano" Papelbon rang up save No. 5. Here's hoping the Blue Jays don't become our 'nemesis' team of 2006 -- if that happens, we may have some issues. The Jays gave Matt Clement the David Wells treatment last night, jumping to an 8-1 lead by the end of the 6th. Vernon Wells had the big blow: a grand slam to dead center. So it's Schill, Wake, and Beck, and then what the heck? It will be interesting to see how Clement and Wells proceed. Sox start a three-game series tonight against Ichiro and the Mariners at Fenway. 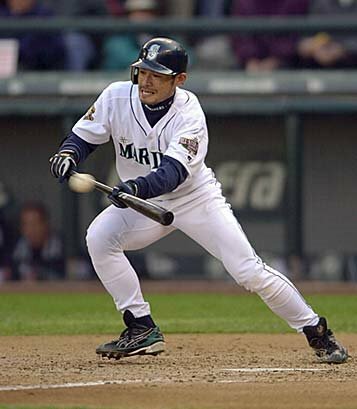 To me, Ichiro is one of those guys (like Vladdy, Pujols, Ortiz) that you pay to go see. We'll never see this guy's skill set again - the ability to do whatever he wants with the wood, the speed, the unconscious cannon... scary to see what this guy would do on the Sox or the Yanks. Side note: big contrast in pitching styles tonight, with Schilling's bullets against Jamie Moyer's soft tosses. Just heard that J.T. Snow is something like 12 for 22 off Moyer in his career -- look for J.T. at first tonight. 7:05 gametime. Sox are now 6-2. Yankees blew out the perpetually pathetic Royals yesterday, 12-5. Unique pitching line of the night: Orioles' Daniel Cabrera -- 5 IP, 3 H, 1 ER, 9 BB, 10 K. Through nine games, Oriole pitchers have given batters 55 free passes. Somewhere, Leo Mazzone is chomping on a few Pepcids. Not even a week after his horrible Triple A outing , 42-year old hellion David Wells takes the mound for the Sox tonight against one of his many former teams, the Blue Jays. Wells, as you no doubt know, had an eventful offseason. He had knee surgery, demanded to be traded because of an overall lack of privacy, and then casually informed Theo one day in spring training that he'd be willing to stay. Thanks, Dave. Interestingly, Wells has always been on record as saying he'd love to blow up Fenway, but did you know the surly, burly man has a 16-1 record at Fenway since 1998? That's borderline insane. Here's hoping past history - and the jolt that comes when you're pitching in front of a packed house at Fenway instead of a sparse minor-league crowd - picks the big man up. If Wells can just duplicate what he did last year (15-7, 4.45) this pitching staff is going to be very, very tough. Two former Marlins led the Red Sox to a 5-3 victory over the Blue Jays today, as Josh Beckett went seven strong and Mike Lowell banged out four hits, including a Monster scraper. Sox had a comfortable 5-1 lead until Wily Mo Pena misplayed a ball into the visitors' bullpen in right for a home run. Foulke pitched the 8th and looked shaky -- Papelbon came on for the 9th and sealed the deal yet again. A couple hundred miles south, the Yankees stormed back in their home opener to beat the Royals, 9-7. Rats. Leo Mazzone woke up this morning with a wicked bad headache. His young Orioles pitching staff - led by the talented/erratic Daniel Cabrera - walked 14 Red Sox batters last night as the Sox won a defensive battle, 14-8. Mazzone, of course, was the highly regarded pitching coach in Atlanta for years, and decided to take a little more money to go work for his pal, new Orioles manager Sam Perlozzo. He may be re-thinking that decision based on last night's sorry performance. All eyes in Boston were on Matt Clement, to see if the 'guy who stayed instead of Bronson' could make us all forget his terrible second-half last season. Clement wasn't quite right after getting hit with a scary line drive in Tampa, but he put together a nice spring and he pitched well last night, albeit more relaxed thanks to his wild counterpart. Clement was staked to a 4-0 lead in the first, which swelled to 10-0 by the end of the fifth. Still, he looked sharp. Manny and Youk banged out three hits each, and Trot hit his second homer of the season, a two-run smash in the 4th. Lowlight was Rudy Seanez' brutal performance, which made us harken back to the glory days of Blaine Neal. He might as well have been putting the ball on a tee. Line drives for everyone! Foulkie actually came on to stop the bleeding in the 9th. In other news, the Yankees' early-season tailspin continues, as they went down to the Angels 4-1 last night out on the Left Coast. They have a tough schedule to start the year, so it would be nice to see the Sox put some distance on them early. How many years have we seen Tito or Grady or whoever take it easy in April, and then see the team finish 4 games behind NY in October? Every game counts, baby, and it's awfully nice to see Tito taking this to heart. Schilling vs. Chen today at 4:35 p.m., weather permitting. The rain is coming down in Baltimore according to the Hardball Heaven Doppler System. It's game #3, and we're not going to get overly excited - no, we don't do that in Red Sox Nation - but we like what we see so far. The present and future was on display during this three-game series with Texas, and last night it was the young gunslingers -- Josh Beckett and Jonathan Papelbon - who caused us to fist-pump (like the lovely Maria Sharapova) at home along with them. Beckett went a superb seven, giving up one run and fanning five, Timlin pitched a clean 8th, and then - lo and behold, Tito threw Pap in there for closing duties instead of Foulkie, who got smacked around pretty good the night before. Papelbon was dominant, hovering in the mid-90's, and struck out Brad Wilkerson to end the game. Of course, the radio airwaves are abuzz this morning about Tito's decision, which really isn't a controversy at all. Foulke's still getting his bearings, and may indeed end up being the closer before the year's out. But it's nice to have the depth in pitching. I think we all believe that Papelbon will be a front-line starter some day -- but why not save his arm right now and have him serve another role? He's certainly got the mentality for closing. Day off today and then it's on to reunite with one of the former idots in Baltimore. 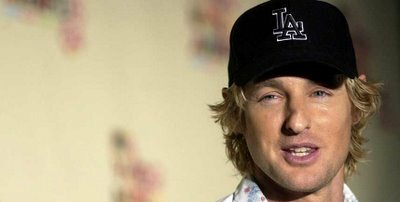 Another idiot alum, Bronson Arroyo, hit a home run yesterday for the Reds off pathetic Cubs pitcher Glendon Rusch --and it wasn't no cheapie. About 12 rows up in the left-field seats. Well, at least we know Josh Bard's uniform number - same as the great Ray Bourque, #77. We know this because Bard spent a good chunk of his time last night chasing down Tim Wakefield's elusive butterflies. In the end, Wake's strange struggles against the Rangers continued, and Bard got his running in for the next couple of weeks. Sox lose, 10-4. Coco Crisp was a bright spot, with three hits and a stolen base. Combined with his nice running catch in the opener, we've seen a glimpse into Coco's tool box in the first two games. On another bright note, thaaaaaaaa-Yankees lose. Thaaaaaa-Yankees lose. Josh Beckett makes his Sox debut tonight in the series finale against someone named Kameron Loe (presumably not related to Derek). Here's hoping Josh has a nice outing - the guy we traded for him, Hanley Ramirez, had four hits last night for the Marlins. The Sox took care of business in Texas today, cruising to a 7-3 victory over the Rangers. It was the Sox' first opening day win since 2000. Everything clicked in this one - well, almost everything. Schilling looked great - not dominant, but certainly much improved over last year. Big Papi resumed his dominance with the maple, smashing a longball off the right-field foul pole, and just missing another homer. Varitek had a key double. Newcomers Loretta and Lowell chipped in with some offense. 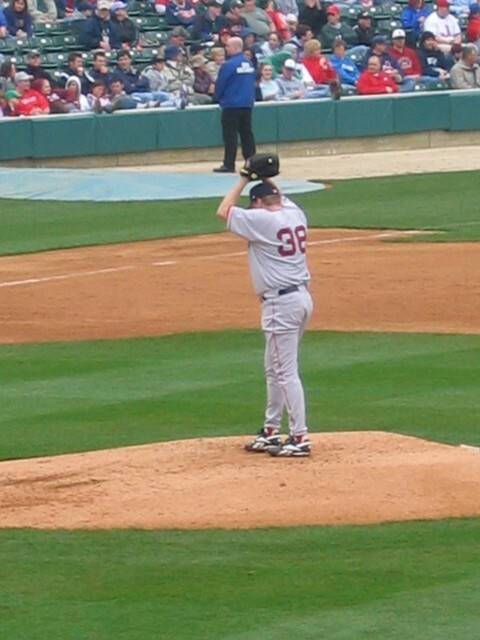 And Jonathan Papelbon (is he a starter? Closer? Set-up man?) pitched a perfect 8th for the bridge to Foulkie, which is where the problems began. Foulkie came on in the 9th and immediately proceeded to get whiplash from watching the Rangers smash line drives all over the park. Coco had to make a sweet running catch in center field to preserve this one. We may see Foulkie pitching the 8th, and Pap closing soon. 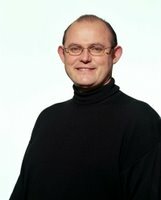 Or maybe Craig Hansen will be on the premises by June. Either way, it's not a day to be negative. We like victories. 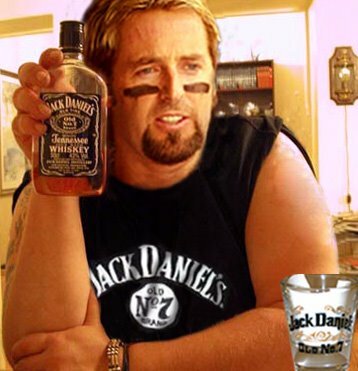 Wake versus Vicente Padilla tomorrow. Happy holiday -- the games are real beginning today (last night really). 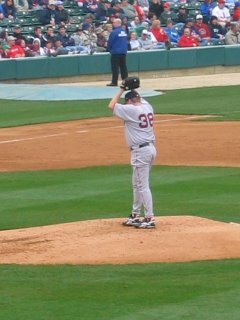 Curt Schilling gets the ball in Arlington, Texas against Kevin Millwood and the Rangers. A late lunch may be in order. D-Lowe and Owe-Wil. In the same hats, even. And both most likely stoned. Uncanny. The season officially gets going tomorrow night with a bang, with the Indians and White Sox going at each other. Sox open up Monday afternoon at Texas -- Schilling against Millwood. The season is here, baby, and not a moment too soon. At least we know, as SI pointed out this week, that we're watching a clean, pure game.